It was prophesised by Guru Rinpoche that in the east, a person named Öser would uphold the heart treasure teachings. And so it was that Dodrubchen Jigme Trinley Öser (a name he would be given much later in his life) was born in the Upper Do Valley in the Golok Province of eastern Tibet. His birth took place in the Female Wood Ox year (1745). His mother, Sonamtso belonged to the Nizok tribe and his father, Zonkho to a warrior clan in the Mukpo Dong lineage. Despite extraordinary signs appearing all through his early years, Jigme Trinley Öser wasn’t recognised as a tulku in his youth. Reaching the age of three, he recounted memories of past lives, much to the apprehension of his parents who feared him to be under the influence of a demonic force. A year or two later, he had clear experiences of the brilliant lights of Thögal, in which he would remain absorbed for some time. At the age of six he gave rise to a strong renunciation in his heart, and from then onwards throughout his youth, he would often be overcome with sadness and tears when remembering the suffering experienced by beings. When he turned seven he was sent to his lama uncle to study Dharma and the reading and writing of Tibetan. He discovered some termas at the age of ten, but since no one paid any attention to them, none survived. Dodrubchen continued his studies at Gochen Monastery under Sherab Rinchen. Although he mainly concentrated on training in the practices of the inner subtle energies and Dzogchen, they didn’t actually improve his spiritual experience beyond what he already innately had. Enduring great hardships, he went on a long pilgrimage that would take him to Thakla Gompa, the monastic seat of Gampopa. There he received many teachings before continuing his pilgrimage to Samye and other holy places in Central Tibet. Again he underwent much hardship, even coming close to death, but through his spiritual attainments all obstacles were transformed into joyous experiences, and he received many powerful visions of deities. On his return to east Tibet he arrived at Shechen Monastery, where he received his refuge vow from the second Rabjam, Gyurme Kunzang Namgyal, who gave him the name Kunzang Shenpen. From the ages of twenty-five to thirty, Dodrubchen stayed around his homeland, fulfilling tasks that were required of him by his powerful tribal group. It was while undertaking one such tribal responsibility that his heart was once more utterly overwhelmed with renunciation, and in a resulting vision, Amithaba Buddha released him from all the grasping and cravings of his mind. It was a powerful turning point in his life and having renounced his worldly ties, he set off for Dzogchen Monastery. There he received and meditated on the Khandro Nyingthig teachings and transmissions. Jigme Trinley Öser made another pilgrimage through Central Tibet and reached Thakla Gompa once more. But feeling uneasy meditating in the monastery with all its distractions, he returned to Dzogchen Monastery and started his three year retreat in the mountains above. He was now thirty-five years old. Overcoming frightening appearances and the extreme lack of food through the power of his meditation, he reached a high level of realisation. Upon finishing this retreat, he moved to the Shinje Cave near the monastery and resumed another four years of retreat. During another short retreat, the third Dzogchen Rinpoche sent him a copy of Jigme Lingpa’s Yönten Rinpoche Dzöd (Treasury of Precious Qualities) which awakened in him an unshakable faith towards the author. Dzogchen Rinpoche advised him to seek out Jigme Lingpa, as meeting such a great master would be far more beneficial than staying in retreat. Bestowing many Nyingthig transmissions such as Nyingthig Yabzhi (Four branches of Heart Essence) upon Dodrubchen, Dzogchen Rinpoche requested him to return with the transmission of Jigme Lingpa’s terma, the Longchen Nyingthig. And so it was that, at forty-one, Dodrubchen was finally and joyfully reunited with his destined karmic guru, Jigme Lingpa, for the first time in that lifetime. 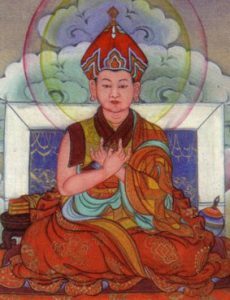 Jigme Lingpa bestowed upon him the complete transmission of both Kama and Terma teachings and named him Jigme Trinley Öser. On a pilgrimage to Samye, Jigme Trinley Öser met Jigme Gyalwa Nyugu and sent him to meet Jigme Lingpa. Out of this auspicious connection, Jigme Gyalwa Nyugu grew to be one of Jigme Lingpa’s most renowned disciples. Both he and Dodrubchen would go on to be the main lineage holders and propagators of the Longchen Nyingthig. On his way back to Kham, Jigme Trinley Öser was overcome with a strong wish to see his root Lama again, so he turned around and went to see Jigme Lingpa once more. At his feet, he received all of the remaining teachings he needed. Together they went to Samye, where, centuries ago, Guru Rinpoche had transmitted the Longchen Nyingthig teachings to King Trisong Detsen. Guru Rinpoche sealed the teachings within the King’s mind-stream, until the time that he would reincarnate as the tertön Jigme Lingpa. King Trisong Detsen transferred the teachings to his son, Prince Murup Tsenpo, who was a previous incarnation of Dodrubchen. And so, like father and son reunited, Jigme Lingpa and Dodrubchen offered a huge tsok in the main temple at Samye. Dodrubchen renewed his Bodhicitta vows and Jigme Lingpa empowered him as the custodian of the Nyingthig teachings. In the meantime, Dodrubchen had been gaining fame as an important lama. With that came requests from many governments and influential members of Tibetan society, both religious and secular. He became one of the main preceptors of the queen and prince of the Dege Palace. He also served the Mongol King, Ching Wang Ngawang Dargye, by transmitting many teachings to him and the people in his region. Although it was Dodrubchen’s intention to travel to Wu T’ai Shan, an edict from the Chinese Emperor, Chia Ch’ing, confined him and his activities to serving as Lama to the Mongol community of the Blue Lake (Qinghai) area. This meant he wasn’t able see his root Lama, Jigme Lingpa again before his passing. However, after a dying request from an uncle released Dodrubchen from his obligations at Blue Lake, he was able to return to his homeland and meet the next incarnation of his Lama, Do Khyentse Yeshe Dorje (1800-1866). Dodrubchen first met Do Khyentse when the latter was only one year old, and joyfully recognising him as the tulku of Jigme Lingpa, he took the greatest care of him. Do Khyentse stayed with Dodrubchen at his encampment, where Dodrubchen also transmitted teachings to many great masters capable of upholding the teachings. Amongst them were the Fourth Dzogchen Rinpoche, the Third Shechen Rabjam and Kathok Situ. Dodrubchen Jigme Trinley Öser established a number of monasteries, primarily Dzagya Monastery and Pemakö Tsasum Khandrö Ling. Together with Jigme Gyalwa Nyugu, Dodrubchen built Dzagya Monastery in Dzachukha Valley. It would become the main seat of Gyalwa Nyugu, and later also that of his most famous and foremost disciple, Patrül Rinpoche. Then, in 1810, Dodrubchen built the meditation centre Pemakö Tsasum Khandrö Ling or Yarlung Pemakö Monastery, in the Ser Valley of Yarlung, and there his enlightened activity continued to flourish. Great masters from far and wide came to see him at Yarlung Pemakö and received transmissions, guidance and advice, including the fourth Dzogchen Rinpoche, Gyalwa Nyugu, Gyalse Shenpen Thaye and many, many others. Having vowed never to leave that place, at the age of seventy seven, amidst an array of miraculous events, he merged his mind into ultimate space. At that very instant, his spiritual heirs all received his spiritual testament, wherever they were. Throughout his life, Dodrubchen practiced at a wide variety of holy lakes, glaciers, and cliff-side caves. He discovered many exquisite mind termas, wrote many prophecies and had numerous visions of Amithaba. He also performed countless miracles, such as making springs appear in a dry area, drawing a stream of water from a rock and averting epidemics and invasions. He could make inanimate objects leap into the air by focusing on them and uttering “Phat!”, and could tame ghosts and reanimate corpses. Because of his unimpeded realisation, psychic abilities and siddhis, people came to see him from all over the upper and lower areas of eastern Tibet, as far away as Tachienlu and other places in China and Mongolia. He turned the wheel of the Dharma tirelessly, bestowing in particular the teachings of the heart essence (Nyingthig) upon his disciples.